Scientists at the University of Connecticut have made adjustable LEDs out of strands of salmon DNA. 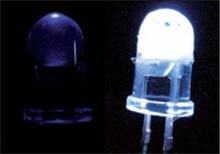 Its mixed with a dye that will absorb UV light and emit a bright white light. The crazy thing about this is that the LEDs can be tuned to emit either warmer or colder white lights. The team basically used two different dyes that had two different types of results. DNA last 50 times longer than acrylic. Its fibers displays the dye molecules better to make energy transfer happen. While this may sound cool, the process of extracting fish DNA may sound a tad bit tedious. How many more fish have to die? !